Deposed Catalan President Carles Puigdemont’s plan to avoid extradition to Spain citing a lack of guarantees for a fair trial in Madrid may prove hard to back up legally under European Arrest Warrant (EAW) rules. But recent rulings on EAW cases show that minimum procedural standards are increasingly being upheld. 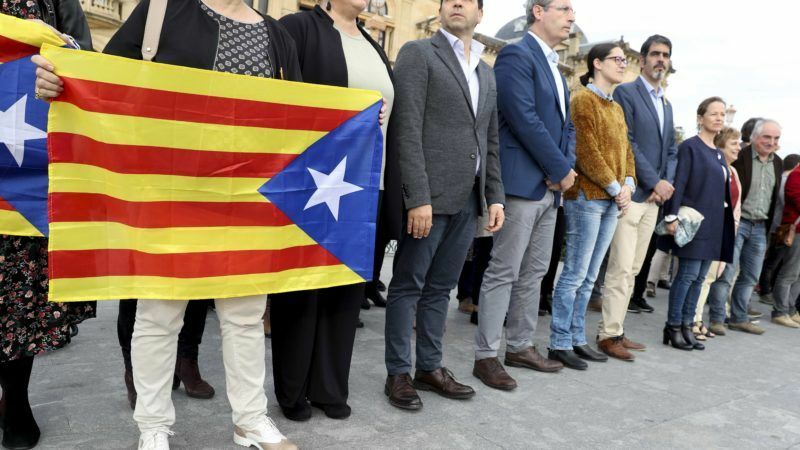 The upcoming legal battle in Belgium comes against the backdrop of the arrest of members of the sacked Catalan government, a move that shocked many in the region and elsewhere. Protests were organised in Catalonia and in Brussels against the Spanish judge’s decision. 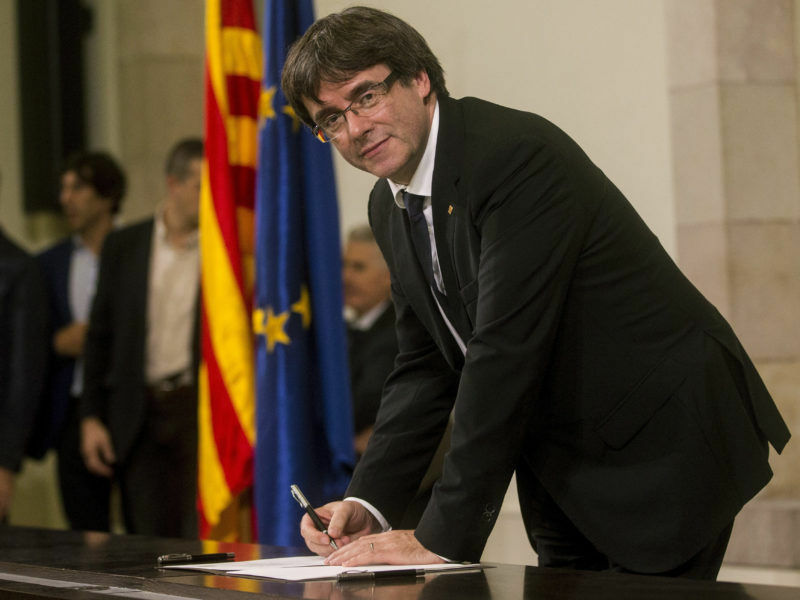 In a recorded message, Puigdemont demanded on Thursday (2 November) the release of the “legitimate” government of Catalonia. He called on Catalans to protest against the Spanish authorities “without violence, peacefully and with respect for everybody’s opinions”. A European Commission spokesperson said on Friday that “it is an internal matter for the judicial authorities and we respect their independence”. Puigdemont’s strategy has been clear since he appeared before the press in Brussels on Tuesday. 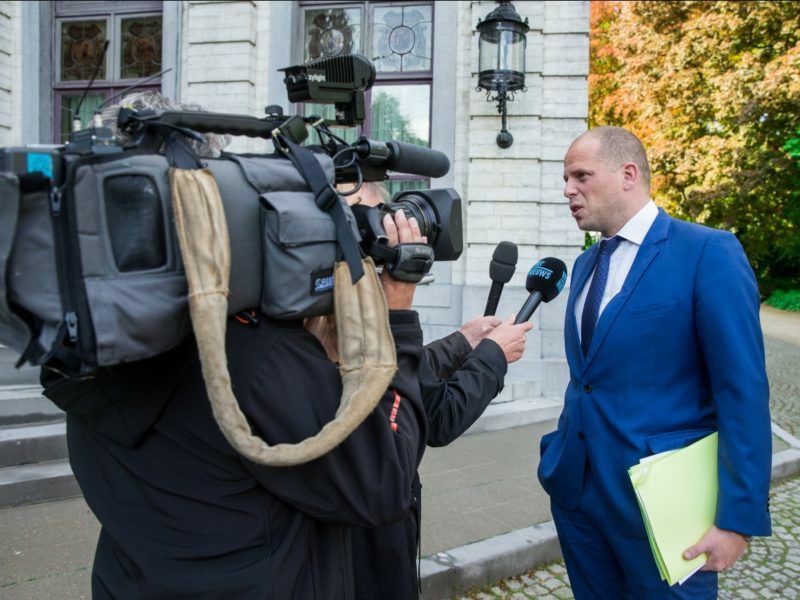 He ruled out seeking asylum in Belgium and instead stressed the lack of “objective conditions” needed for his return to Spain, warning that he would not be granted “fair, independent” treatment. This plan to counter the expected European Arrest Warrant was already signalled by his choice of Belgium, whose judges previously rejected an EAW issued by Spain in 2013 for Natividad Jauregui, an ETA member wanted on terrorism charges. Puigdemont’s first meeting in exile on was with Paul Bekaert, the lawyer who succeeded in blocking the EAW. “The climate is not good, it is better to keep some distance,” Bekaert said this week. The appearance before the judges on Thursday of members of the dismissed Catalan government and the regional Parliament hampered Puigdemont’s main line of defence. But the pre-trial detention of eight of them, including the vice-president, could help his case before the Belgian judges. Judge Carmen Lamela is expected to issue the EAW on Friday for Puigdemont and four other members of his sacked government, who are also in Belgium. On Thursday the prosecutor requested the warrant to bring them back to Spain. A Belgian judge would then decide whether they are sent to pre-trial detention while their lawyers argue against their extradition. The EAW foresees very few exemptions that make it possible for judges to dismiss petitions issued by their counterparts from another EU member state. Puigdemont and his four colleagues are accused of rebellion, sedition and misuse of public finances. Created in the post-September 11 context, the EAW was designed to speed up legal procedures by ensuring that fugitives inside the EU do not escape from judges and prosecutors. In order to increase the effectiveness of the system, member states provided few loopholes, none of them related to fundamental rights protection. Initially, the protection of minimum guarantees was unclear, leading to a “legal twilight zone” in which member states’ authorities must operate, Michaël Meysman, a researcher at the Institute for International Research on Criminal Policy (Universiteit Gent) concluded in a paper. After assessing the 2013 Jauregui case, he said that the situation back then “let diversity and arbitrariness take the lead and potentially expose the individual involved in these procedures to situations refused for fundamental rights”. But experts note the situation may be changing. Steve Peers, a professor at the School of Law at the University of Essex, noted that over the last three years, there has been a “striking concern” in the EU Court of Justice “for ensuring at least some protection for human rights” within the EAW system. “Despite the reluctance of the EU to chastise member states for systematic concerns about the rule of law (one of the rare options to block the EAW), the EU Court of Justice’s rulings at least ensure that any general human rights concerns are addressed at the level of application of EU legislation,” concluded Peers. The Belgian judges’ decision will be influenced by the EU rulings, as the EU Court of Justice will be the final arbiter in case there is a dispute between the Spanish and Belgian authorities. Belgian judges have already shown a particular interest in ensuring human rights standards, as they proved with Jauregui’s case. The ruling noted that the EAW is based on “the high level of trust between member states”, which “implies a presumption of respect by the issuer member state of fundamental rights”. But according to the court, Bekaert proved that there was a “manifest danger” to their rights, as the imprisonment of alleged terrorists in Spain “may be accompanied by torture and very limited contact with the outside world”. Sacked Catalan president Parles Puigdemont met on Monday (30 October) with a lawyer in Brussels as the Spanish general prosecutor called for charges of rebellion and sedition over his role in Catalonia’s unilateral declaration of independence. Part of the reasoning was based on the 2011 report on Spain by the Council of Europe’s European Committee for the Prevention of Torture and Inhuman Treatment. 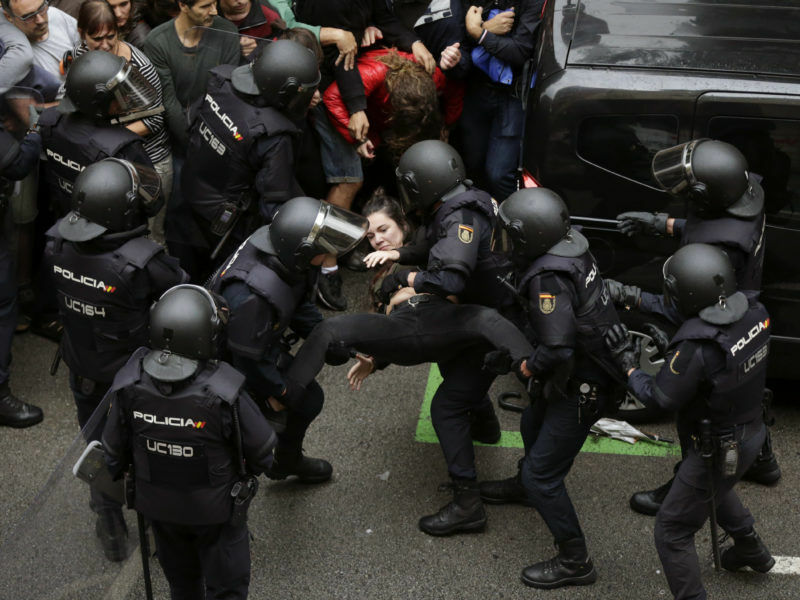 In the report, the committee highlighted cases of abuses by the Guardia Civil, a military force, while it gave its overall approval to the National Police. But the committee expressed its concern about the overpopulation of Spanish prisons, an important issue over recent years. The situation of the Spanish cells may play a role in postponing the EAW. The European Court of Justice pointed out in April 2016 (Aranyosi and Caldaruru) that member states, in this case, Germany, had to take into account concerns raised by fugitives about prison overcrowding in the countries that issued the warrant, in this case, Hungary and Romania. German judges were told to assess whether there was a systemic failure to ensure decent prison conditions and whether a “real risk” existed for the affected fugitives to be subject to those conditions once the EAW was executed. As Peers recalls, if decent conditions were not met, the EU judges were “unwilling to backtrack from [their] position that the list of grounds to refuse to execute an EAW set out in the law is exhaustive”. Instead, the judges from the executing member state would postpone the execution of the EAW until the situation in the issuing state had improved. The British professor noted that the ECJ is “vague” about the grounds for postponing the execution of an EAW. But if necessary, the deadlines to execute an EAW could be ignored, as stipulated in another recent ruling (the Lanigan case). The rules say that the Belgian judge would have sixty days to notify Spain of its decision on an EAW for Puigdemont. Bekaert would find it hard to use his 2013 arguments to block the warrant, as Puigdemont does not belong to a terrorist organisation. As regards prison overpopulation, the COE’s report noted the reduction from 143% occupation rate in 2007 to 112% in 2011. The committee also highlighted that Spain was building 9,000 double prison cells. 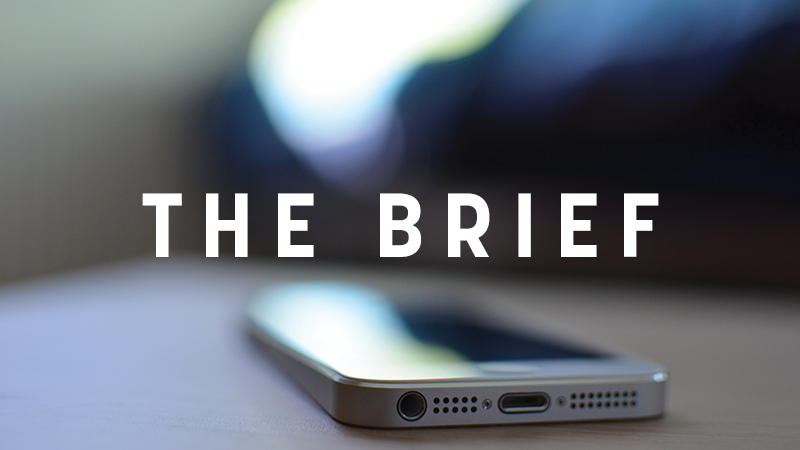 The COE is in the process of finalising a new report based on its visit to Spain last year. On that occasion, the delegation also visited Puerto II Prison (Cadiz) and Madrid V Prison (Soto del Real), to interview pre-trial prisoners. 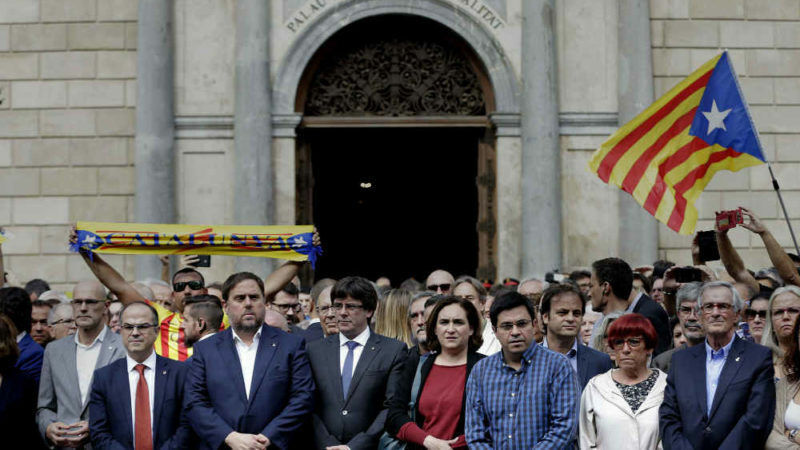 Their preliminary conclusions, so far only shared with the Spanish authorities, could have an impact on this case as all except one member of the sacked Catalan government were sent to prison for their involvement in the declaration of independence. Both the Belgian justice system and the EJC take into account the Council of Europe’s conclusions. EU judges have also considered additional procedural arguments to postpone an EAW. These are whether it is issued in a “valid” way and whether there is a real “separation of powers” to ensure independent judicial oversight and the length of pre-trial detention. In the first case, a judge issued the EAW, as stipulated by the rules. As regards the separation of powers, Puigdemont and other pro-independence members have questioned the Spanish judiciary system. They have attacked the politicisation of Spain’s judicial system by pointing out that the general prosecutor is named by the government and the top judiciary bodies are elected by the parliament. But Spanish judges have sent to jail numerous politicians from various parties, including the ruling People’s Party (PP). As regards the length of pre-trial detention cases, Luis Barcenas, the former PP treasurer involved in a corruption case, spent 19 months in a cell before being released in January 2015. But the length of pre-trial detention in Spain could be used as an argument to postpone the execution of an EAW only if Puigdemont is not detained in Belgium in the meantime. The argument of over crowded prisons is beyond ridiculous. The approach should be very simple: Belgium declares Puigdemont a persona non grata who is asked to leave the country since his presence is creating political tensions. He can then chose where to go. If he has a bit of brain left he goes home and faces the judges. Because he did break laws and he needs to assume his responsibility. He can also fly to Venezuela and make a complete clown of himself. Missing from this report is the sentence if found guilty: 15 to 30 years in jail. This is a piolitical trial – instigated by a man (Ratjoy) whose own party is mired in corruption. I am confident that common sense will not prevail (it never has in the case of the EAW (the Guardian newspaper has plenty of articles on the subject). The EAW was intended to be used against criminals – not against people that took wise (or unwise) POLITICAL decisions. This is a political problem – Ratjoy has decided to play the criminal card – it could well blow back in his face – I hope it does. Hope Puigdemont will face at least a min of 25 years (written in the constitution and NOT instigated by X ) jail for his criminality against the spanish constitution and democracy by taking his own citizens as a political weapon. Concerning Rajoy and his cigars . Well i applause him how he’s defending the spanish democracy as a whole. No justice ? Where are you livin’ ? About dictators ?? Where is in Spain a dictator ? The I ask You how the governement has been elected . Somwthing lackin’ the iq ..
Morocco should rein in its share of Iberian land that are nothing but its domain as it was back in 1200. Please Morocco, retake and civilice that land of yours. As lame MEPs are not able to call article 7. Puigdemont = a danger for Catalan citizens and Democracy. Puigdemont = leader of one of the most corrupt political parties in Europe. Is that aceptable for the EU and Belgium?